The rumored Audi R20 hypercar was supposed to be built directly from Audi's Le Mans-winning R18 E-Tron diesel hybrid race car. I never reported on it because I took one look at the design and inferred that it was never going to happen. Looks like I was right. The R20 was supposed to use the R18's carbon fiber monocoque. It is difficult to stress how difficult it would be to stretch the R18's single-molding safety cell into something that would fit two people. It is also difficult to imagine how expensive it would be to redesign that monocoque to fit two people, let alone re-engineer the car's cooling, aerodynamics, and safety systems, let alone build 333 of them (as C&D proposed). The R18 E-Tron Quattro's diesel-in-the-back/electric-up-front drivetrain is so complex that you'd probably have an easier time making the Nucleon than prepping the R18's turbo V6 for the road. A variety of Le Mans prototypes have been converted into road cars: the Nissan R390, the Mercedes CLK GTR, the Toyota GT-One, and both generations of the Porsche GT1. These cars were all received as difficult to drive, ugly, unpopular, and generally awful. Amazing, but awful. It's hard to imagine Audi looking at the past record of these cars and wanting to join in. The exception to the rule was the McLaren F1 GTR, but that started out as a road car in the first place. So join me as I mourn this car that appears to have only existed in the fertile minds of car nerds listening to German engineer-executives pleasure themselves. It would have been awesome and I hope my skepticism is unwarranted. 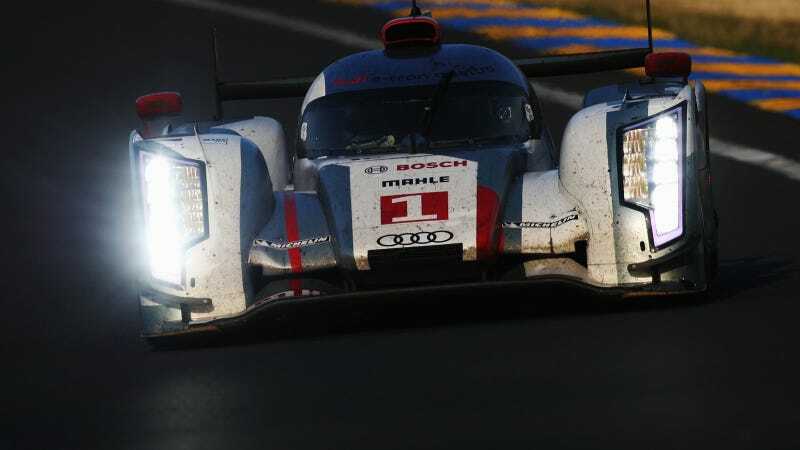 ...based on the Le Mans winning R18, is dead.